Somedays even the most devout foodies struggle to come up with ideas for mid week cooking. 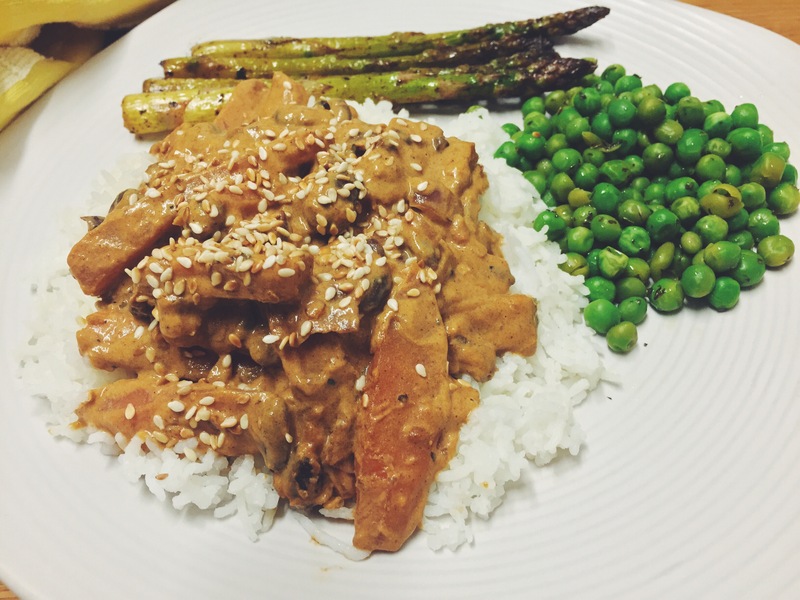 I don’t know if it’s the lack of inspiration or sheer laziness but for some reason cooking has felt like a real chore this week. Thank god Melbourne’s takeaway scene is delicious and bountiful. However when you have a rapidly growing little hungry hippo to feed, meals have to be more about nutrition than convenience. If you can find a meal that’s both nutritious and convenient then you’ve hit the jackpot. So after a few nights of sparing my kitchen, I got in there last night determined to whip up something lip smackingly delicious. 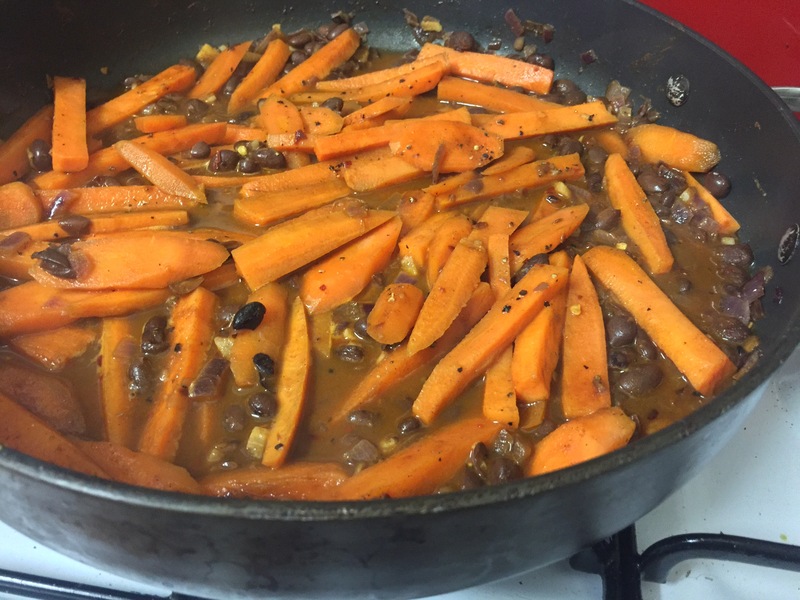 This is how one sweet potato, couple of carrots and a tin of black beans came together to make a quick and easy, healthy and tasty meal for my family. Heat oil in a heavy bottom saucepan. Add onion and garlic. Cook for one to two minutes until onions are slightly caramelised and aromatic. 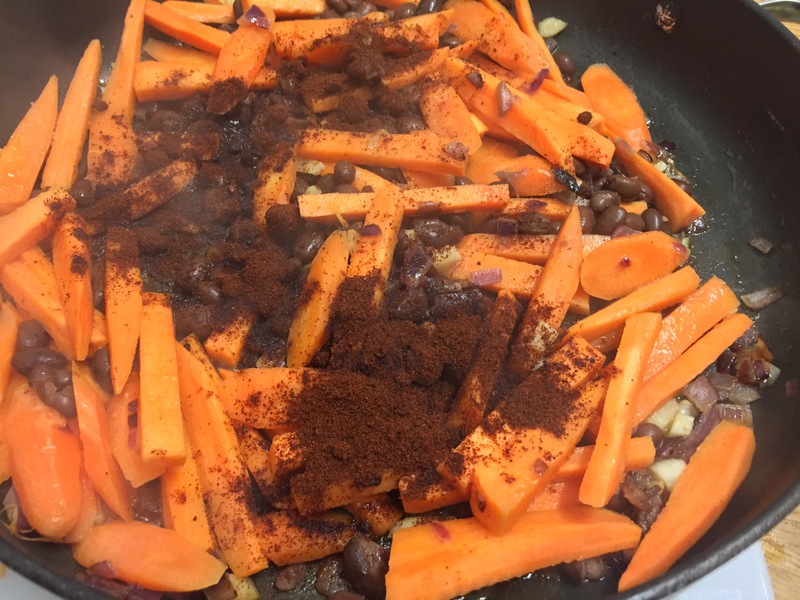 Now add sweetpotatoes, carrots and black beans. Mix well. Then add smoked paprika, chilli flakes, black pepper and lemon juice. Mix thoroughly. Add one cup of water, cover the pan and let the veggies and beans simmer on a medium heat for 15 minutes. Once the sweetpotatoes and tender add sour cream. Mix well. Season with salt to taste and cook for another three to four minutes. 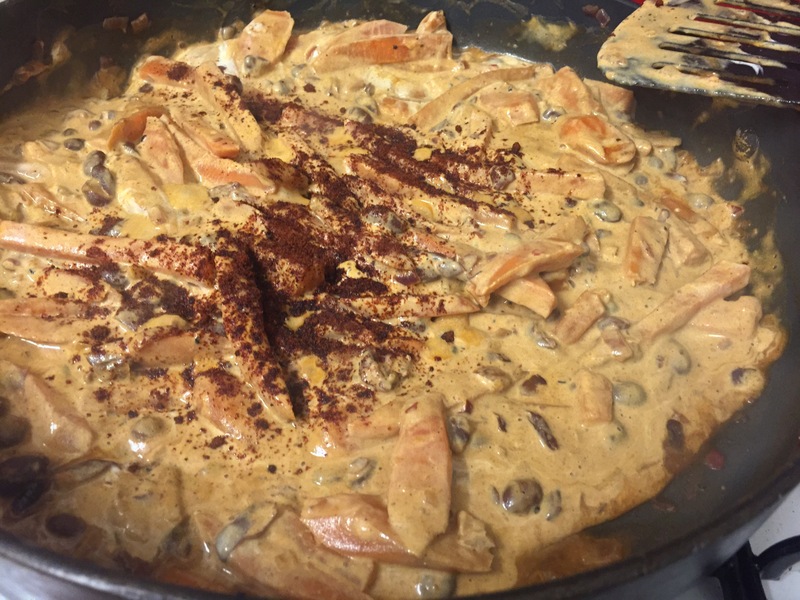 Your lip smackingly delicious stroganoff is ready to serve. You can serve it with polenta, cous cous, pasta or rice. 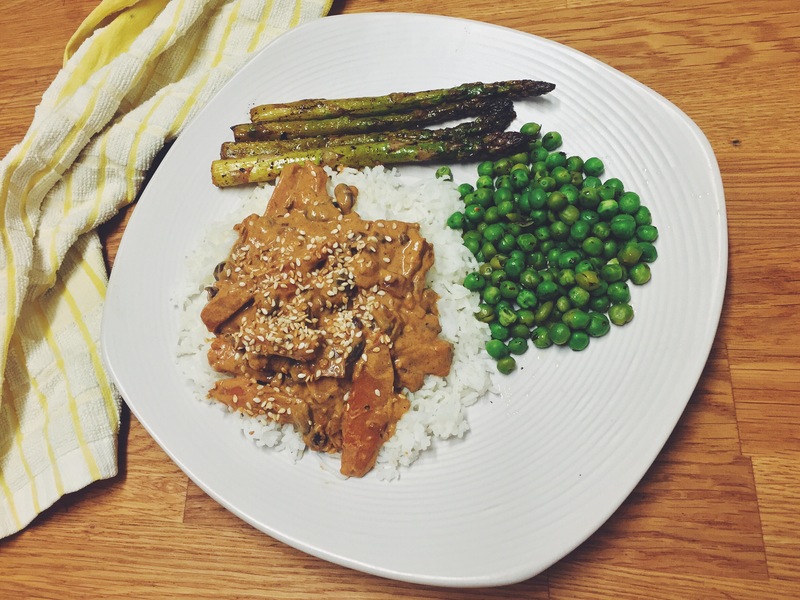 I have served it with some steamed rice, lemon butter asparagus and minted peas. 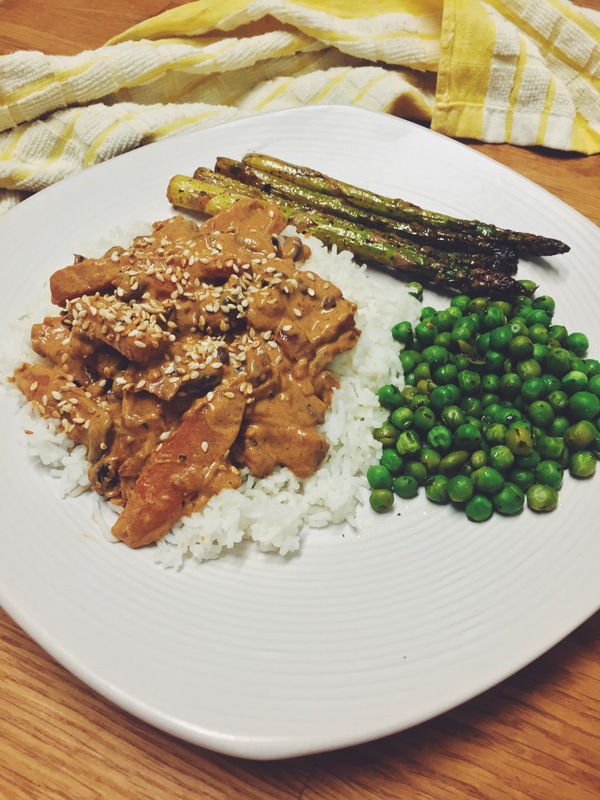 A wholesome meal for those hectic week nights.